Tonight at the Old State House’s “Second Friday Cinema” September 30, 1955. The screening starts at 5pm. Starring Richard Thomas and future Oscar winner Lisa Blount, the film is about an Arkansas teen’s fascination with his film idol James Dean, and his reaction to the news of Dean’s death in a car wreck. The movie, set in 1950s small-town Arkansas, was written and directed by Arkansan James Bridges. It was filmed in and around Conway. At the time much of downtown Conway and the campus of UCA were largely unchanged since the 1950s. September 30, 1955 is one of Bridges’s more personal films and is in contrast with his more well-known films which include The China Syndrome, Urban Cowboy and Bright Lights, Big City. The tagline sums it up with: In twenty-four hours, a nice college kid named Jimmy J. robbed a liquor store, got drunk, held a séance, crawled through a cemetery, raided lovers’ lane, dropped the Homecoming Queen, and went to jail. 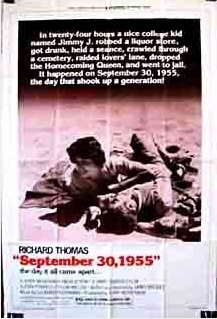 It happened on September 30, 1955, the day that shook up a generation! Others in the cast include future Oscar nominees Tom Hulce (before Animal House), Susan Tyrrell and Dennis Quaid. Tom Bonner’s voice is heard as a radio announcer. Ben Fry, general manager of KLRE/KUAR and coordinator of the film minor at UALR, will introduce the film and lead a discussion after the screening.